After corporations take over the world in Nature's Confession, by J.L. Morin, humanity is stuck in an endless cycle of busywork. Students are brainwashed by the school system, reading censored history textbooks and encouraged to not ask questions. Society has devalued individuality, because “outliers soon start having their own ideas.” Boy, a teenage genius, has managed to escape the indifference that afflicts his fellow citizens. While working on a computer program meant to find a solution to the environmental and social justice issues in the world, he accidentally creates living computers. His creation comes just in time to see humanity enslaved by the Emperor of Earth and Ocean, and the environment completely destroyed. To avoid being dragged to an underwater living compound, Boy and his family jump on an alien ship and run away to a distant planet. There, they participate in a variety of adventures that will determine the fate of Earth. Corporate personhood is a very real threat, as companies continue to gain legal rights once reserved only for individuals. Environmental problems are a concern as well—air pollution in Beijing is so serious that government officials often suggest citizens wear face masks while walking outside. Social justice and environmental issues are very relevant today, and Nature’s Confession does a brilliant job of imagining the possible results of today’s social ills. The dystopian, science fiction novel is written from multiple perspectives, including those of Boy, his mother, his sister Kenza, and even an alien dog. The variety of viewpoints give the reader a more complete view of the world the characters experience, and are a huge asset to the story. The incorporation of future-lingo, like “transp” fashion and “manipulatedfat” people, allows the characters’ language and conversations to act as a reminder of this setting throughout the book. I loved the universe Morin described. While the world clearly reflected our own Earth, there was plenty of thought and imagination put into “Enslaved Earth.” Whimsical inventions-- like an alarm clock that uploads embarrassing baby pictures to the Internet if one doesn't get out of bed in time—and the inclusion of space travel and alien life ensured that the story was entertaining. The book was not only a fast-paced, entertaining read—the themes of thinking for one’s self, valuing individuality, and the corrupting power of money are woven throughout Boy’s story. The readers are called to think critically about their own lives, and their own role in enabling the greed of the human race. The author’s ability to combine intense social commentary with a genuinely enjoyable reading experience is impressive. The futuristic setting, regulated society and space travel plot of Nature's Confession reminded me a lot of A Hitchhiker’s Guide to the Galaxy, and the regulated society was reminiscent of the society in A Brave New World. 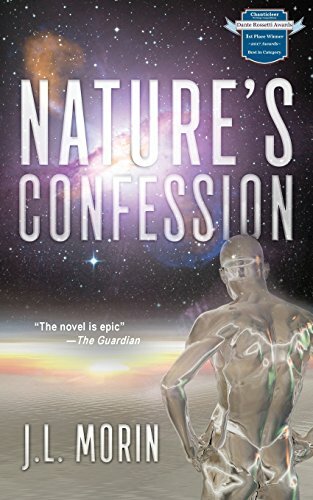 Fans of science fiction and dystopian novels will love Nature’s Confession, and I would recommend the book to teens and young adults interested in a fun, thought-provoking read.